Since the Cold War, one of the most challenging and urgent tasks facing governments around the world has been the disposal of transuranic nuclear waste. As a by-product from nuclear weaponry production, high-level waste is not only harmful, but also boasts a formidable decay process lasting thousands of years. To address this issue, millions of barrels of highly radioactive waste have been buried in repositories deep beneath the earth’s surface. To ensure public safety, it is imperative that sites remain undisturbed for the duration of the waste’s decay process. 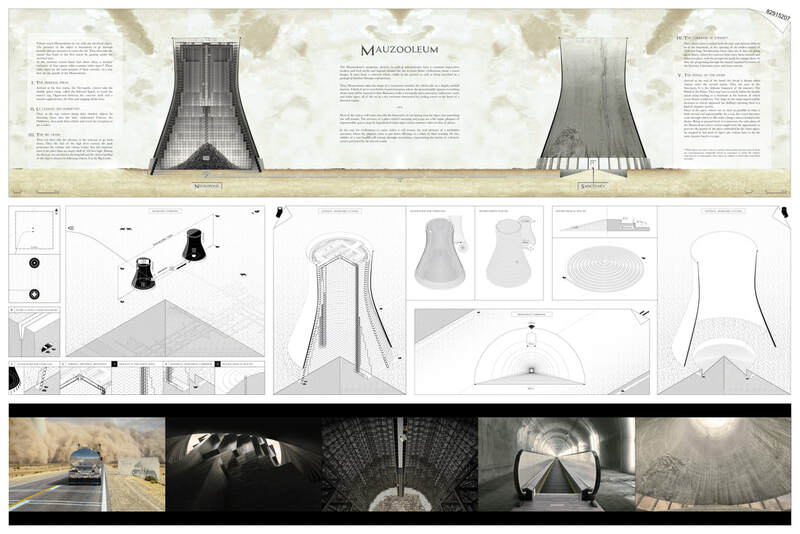 arch out loud is releasing the NUCLEAR competition asked designers to submit architectural proposals for markers. 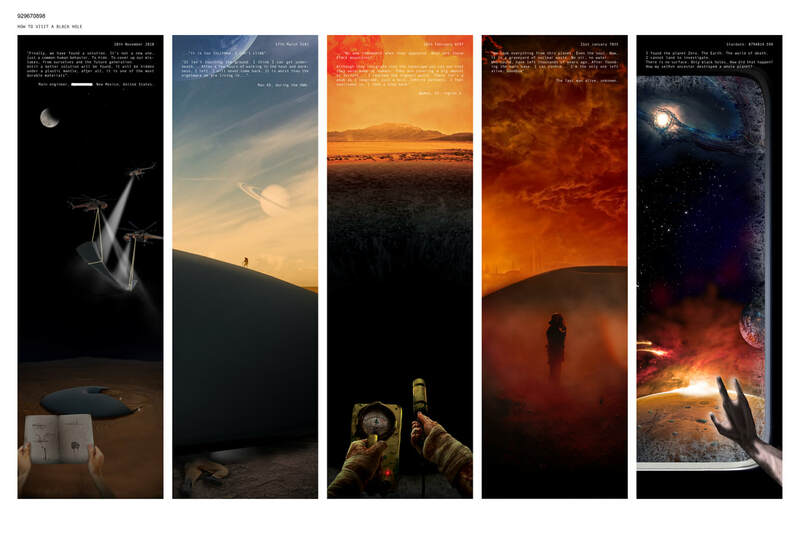 These landmarks will serve to warn future societies of the dangers of such a site. Testbed transforms the WIPP area into an experimental field of climate engineering that manipulates the geology of the site itself by setting in motion an open-ended assemblage of processes that generate an entangled scientific earthwork of hybrid formations.Testbed deploys an array of C02 capturing strategies across the site to generate an active marker system that uses climate engineering to store one form of energetic byproduct—CO2—in the surface, above the transuranic waste secured below. Through continued transformation, these new geological forms mark the site as something deeply strange and unfamiliar and communicate its otherness by intervening in fundamental processes. 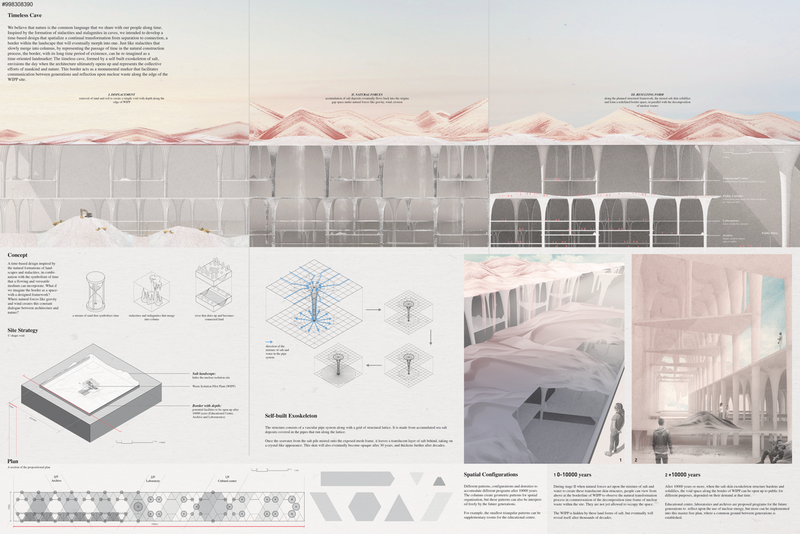 Testbed takes advantage of the site’s compromised condition to encumber it through experimentation, doubling down on disturbance to ensure the site will remain undisturbed. For millennia, cultures across the world have attached deep significance to celestial movements and cycles. Ancient civilizations derived meaning from constellations and planets and wove astrology into mythology and religion. In the second millennium, sailors used the stars to navigate an unknown world. Among these stars, the North Star has held the greatest importance as a means of wayfinding. 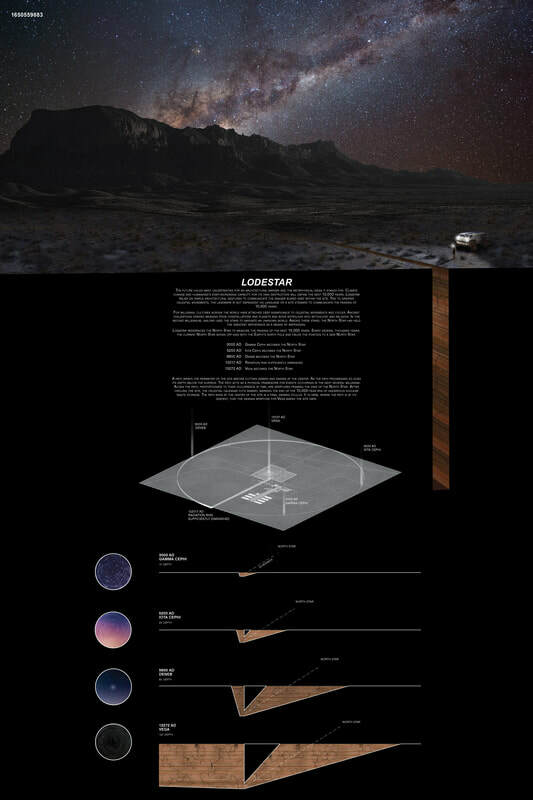 Lodestar relies on simple architectural gestures to communicate the danger buried deep within the site. Tied to greater celestial movements, the landmark is not dependent on language or a site steward to communicate the passing of 10,000 years. 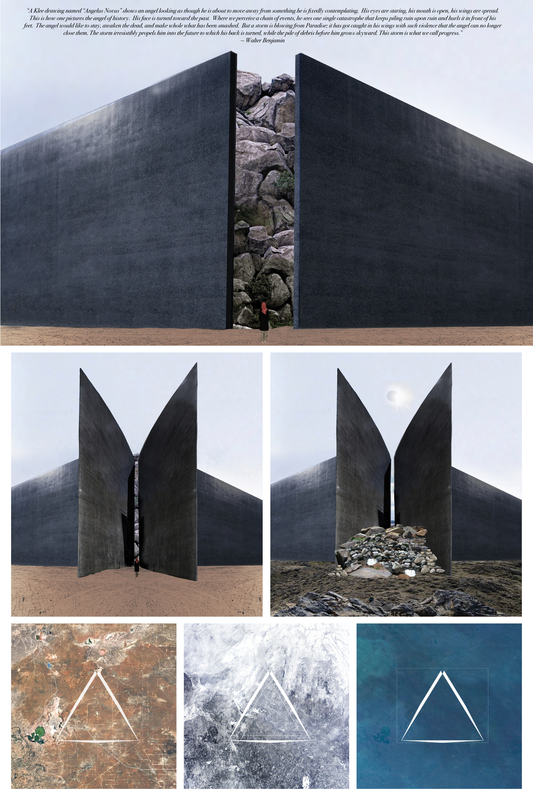 A contrast between monument and terrain signifies a tension between geological resources and human affliction. This monument symbolizes a parasitic operation that reaches deep into the darkest side of humanity. It is a memorial for the exploitation of Mother Earth, the Native American mining communities, the genius of scientists, 130,000 individual lives, and the endless generations to come that are affected by these operations. Volcanic basalt stone wraps the perimeter of the 16 mile site. Within this, large boulders fill the interior. These boulders would erode and slip out of the open corners of the monument, eventually to become cemented into the geological strata; a physical recording of anthropocentric presence and perhaps, absence. A wall of thick CNC laser sintered glass slabs surrounds a highly ordered desert garden - a hortus conclusus. 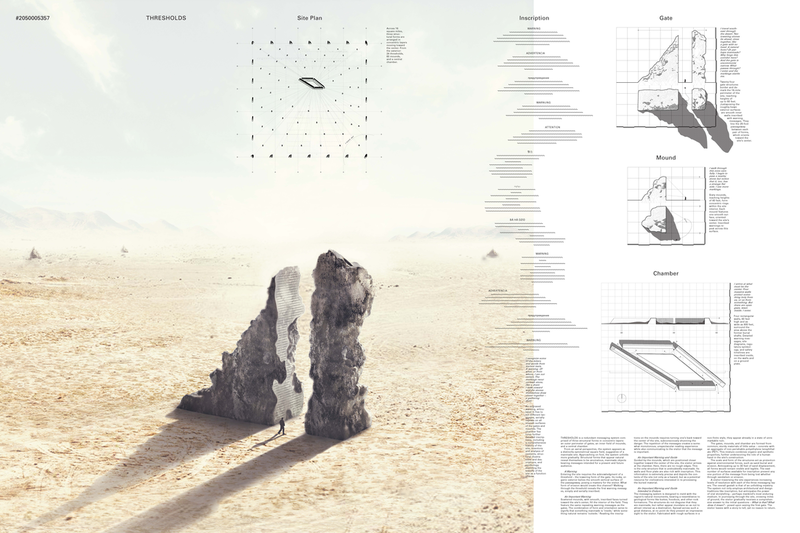 The curved and honed slabs use the principles of caustics and refraction (inversion, doubling, splitting, magnification) to carefully construct an optical illusion of mutated and distorted desert life beyond the wall. However, due to the high probability of natural mutations and new hybrid species emerging out of the extremely caustic radioactive environment surrounding the WIPP, one is forced to question what is merely a lens effect and what is a living mutant. Regardless of the truth, the hyper-distorted desert mirage warns one, without language, that what exists beyond the wall is not safe. We cannot predict the future. Any sign or symbol we understand today may or may not be comprehended by future civilisations. 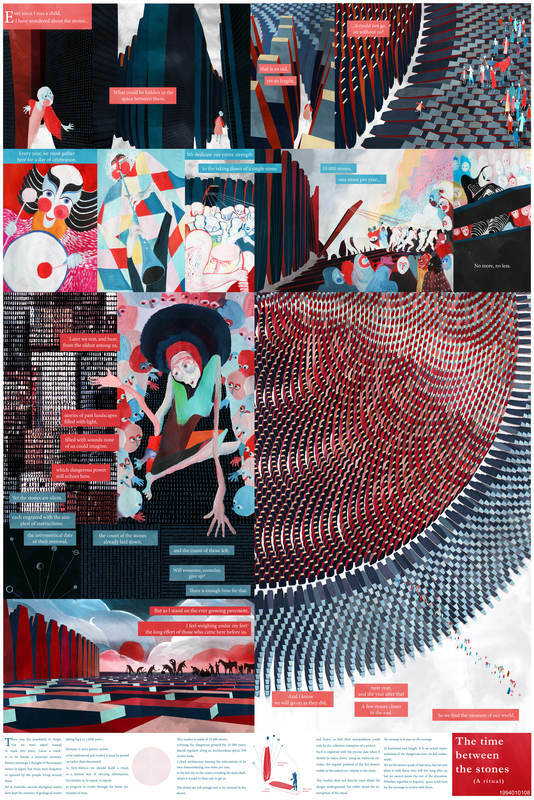 Colour transcends linguistic and cultural thresholds. 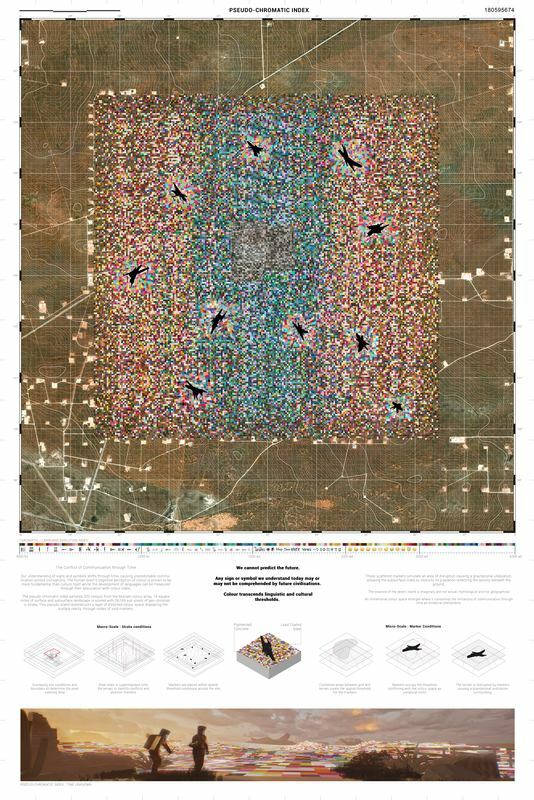 16 square miles of surface and subsurface landscape is scored with 28,166 subpixels of geochromatic strata. This geological division of space curates an artificial landscape that exists through the passage of time as immemorial unnatural phenomena. THRESHOLDS is a redundant messaging system comprised of three structural forms: an outer perimeter of gates, inner field of mounds, and central chamber. The system melds with the region's natural monuments and rock formations to deter interest as a destination. Spread across distance and fabricated with rough, rocky surfaces, the individual forms are an unimpressive sight; they appear already in a state of ruin. Repeating inscriptions yield to precise information as a visitor traverses the three messaging layers. The overall gestalt is that of an unfolding mystery, leaving the visitor with a story to tell, yet no reason to return. 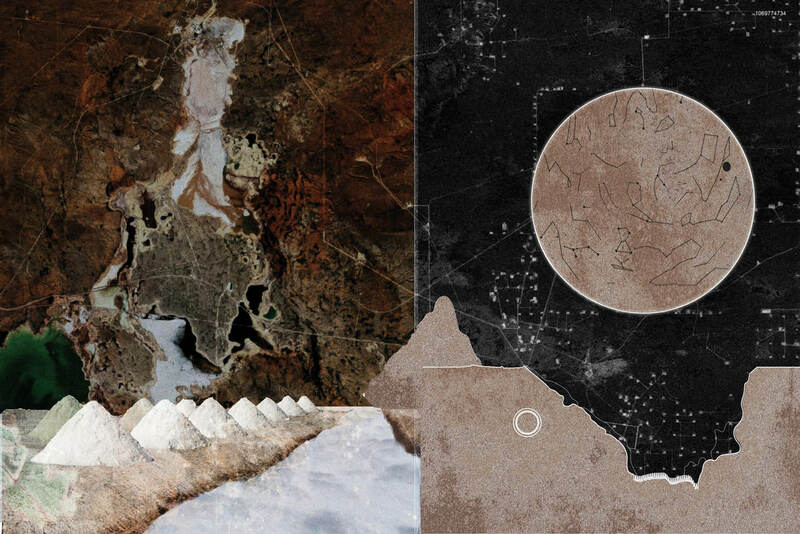 The Salt Sepulcher and the Terrible Garden scripts a nested sequence of creation, celebration, erosion and discovery. 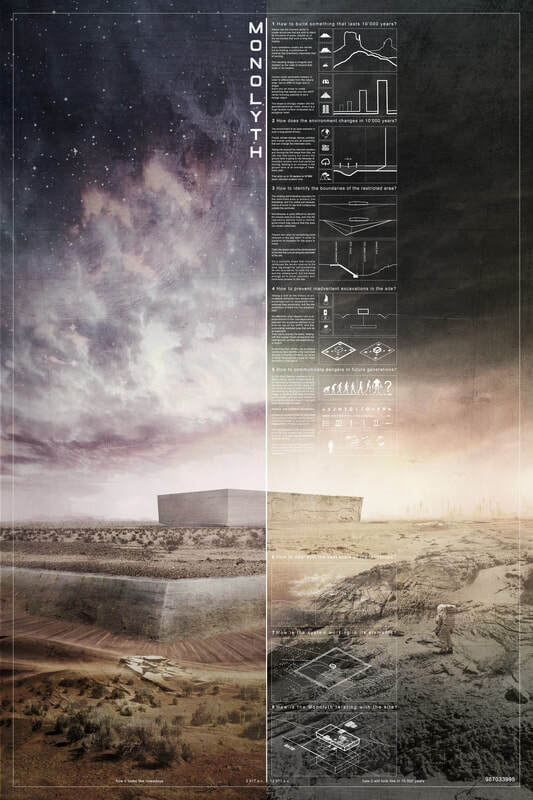 It does so in order to produce a monument capable of inspiring the social institutions necessary to ensure continued memory, awe and caution concerning the WIPP site. 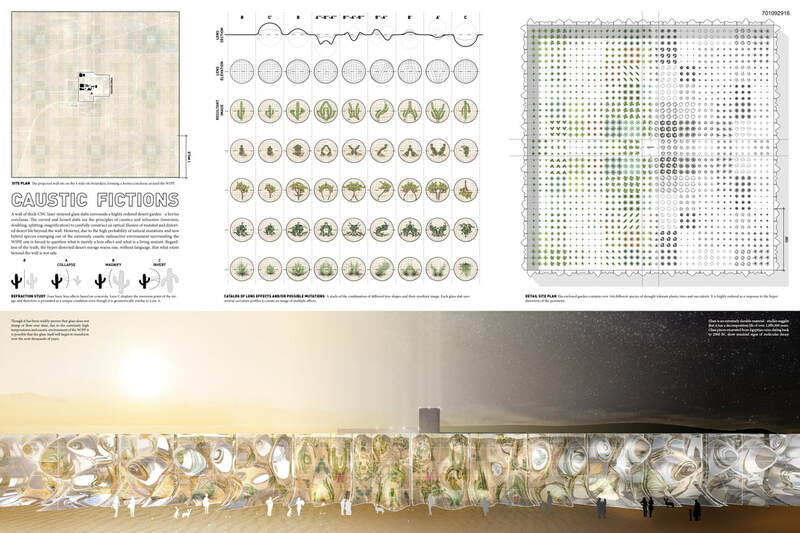 The proposal rests upon the staged production of an 100-foot cubic salt crystal. 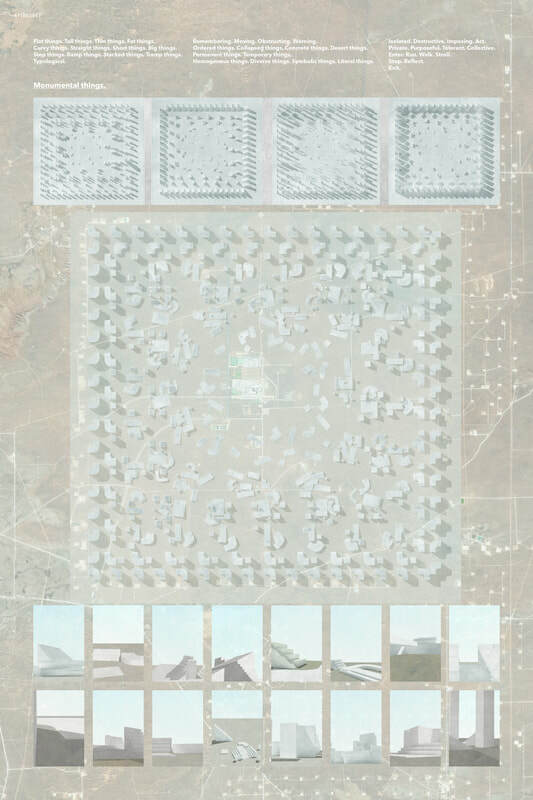 A series of site structures help to celebrate and narrate the crystal over time, from the active life of the WIPP site to the projected 10,000 year lifespan of the crystal. The contemporary human-earth interaction is a human-centric monologue. Regardless of time and culture, the five senses [hearing, sight, taste, touch and smell] are the foundation of any means of communication between hum­ans and non-humans. 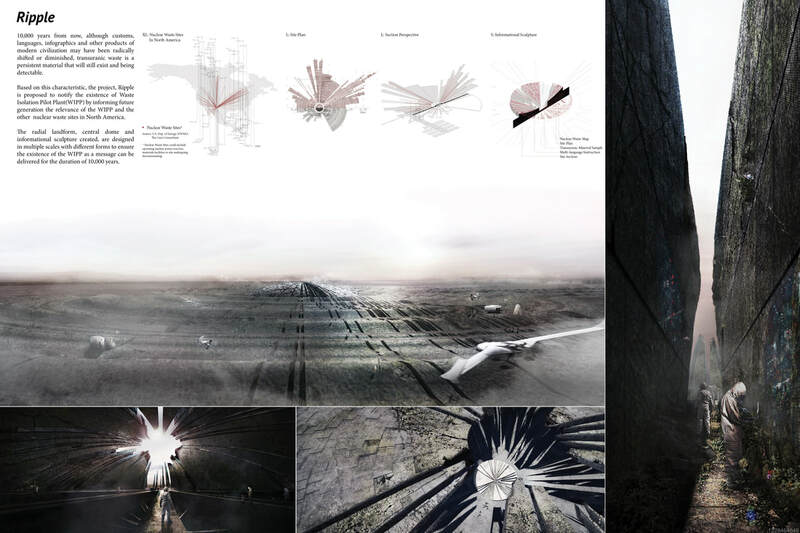 The concept, its pipes and the grid, are based on the geographical expositi­on of the site and wind as an enduring product of the environment. To make hidden processes tangible, the wind organ communicates audio visually and creates an unworldly space. Terrestrial Rhapsody enables earth to communicate and speak for itself and develops a dialogue between humans, non-humans and earth, thus making earth an empowered actor. The only historical constant is evolution. 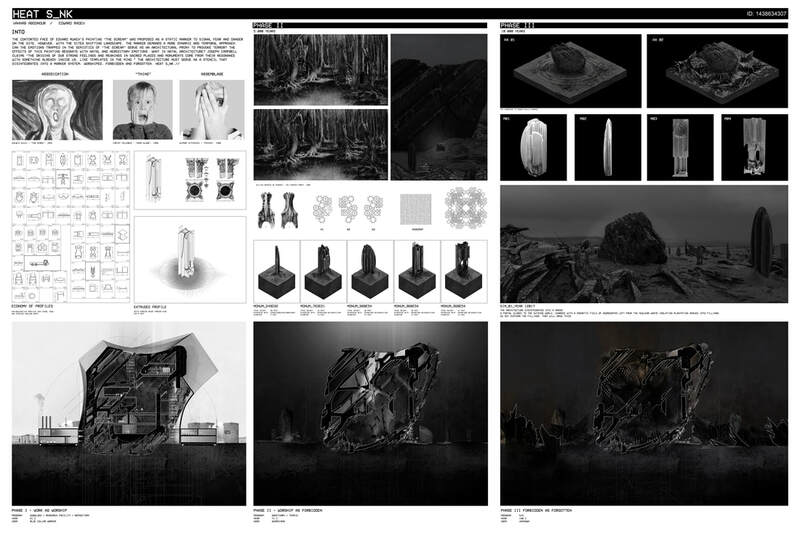 Instead of a semiotically-articulated message due to be lost in the arc of time, our plan is to design intensities of contamination and let an ecology emerge. 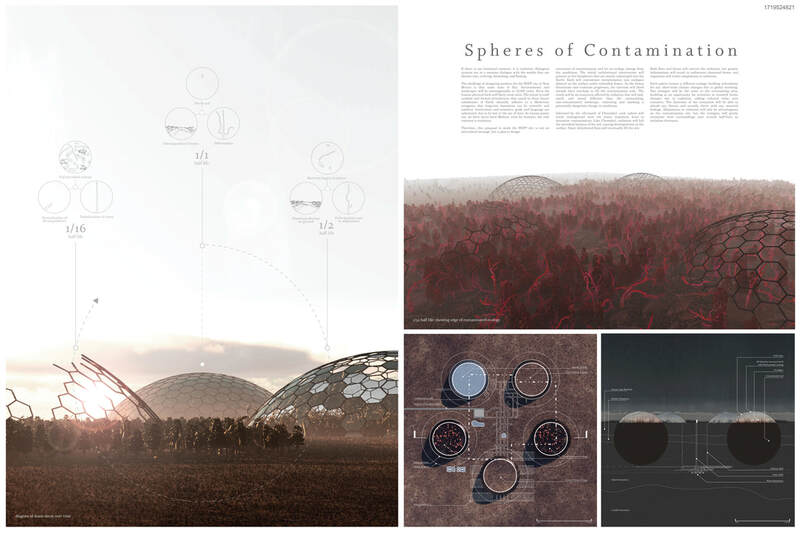 The initial architecture will present as five biospheres mostly submerged underground. Contamination will be concentrated in the soil and passed to flora planted under surface domes. As the domes deteriorate and evolution progresses, the interiors will bleed outside their envelope to fill the contamination zone. The resultant radiation-affected ecosystem will look, smell, and sound different than the surrounding, non-contaminated landscape, indicating potentially dangerous conditions. The monument signifies immobility, inalterability and immediacy. As a result of the permanence and collectivity of the monuments, the continuous development of the urban identity is reflected. Devoting ourselves to preserving the memories of a destructive past, the construction and positioning of the monuments warn individuals of an unforeseeable future. The arrangement of these monumental objects adapt in real dimension individually while remaining intact as a whole. In conjunction to establishing continuity in the public domain, the myth of the architectonic forms produces a sense of transition between order and chaos; thus warning the visitors of its danger. These columnar forms will follow the traces of the waste power plant. 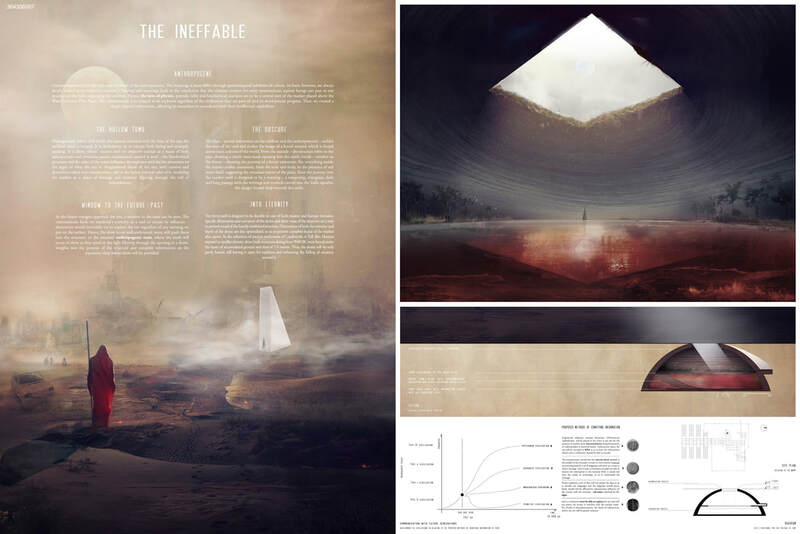 The installations, inspired by Di Maria's Lightning Field, will attract lighting, an occurrence that has instilled fear and danger in humankind for centuries and a phenomenon that will continue for centuries more. The lower section will be made of marble that will erode until its disappearance after 10000 years. 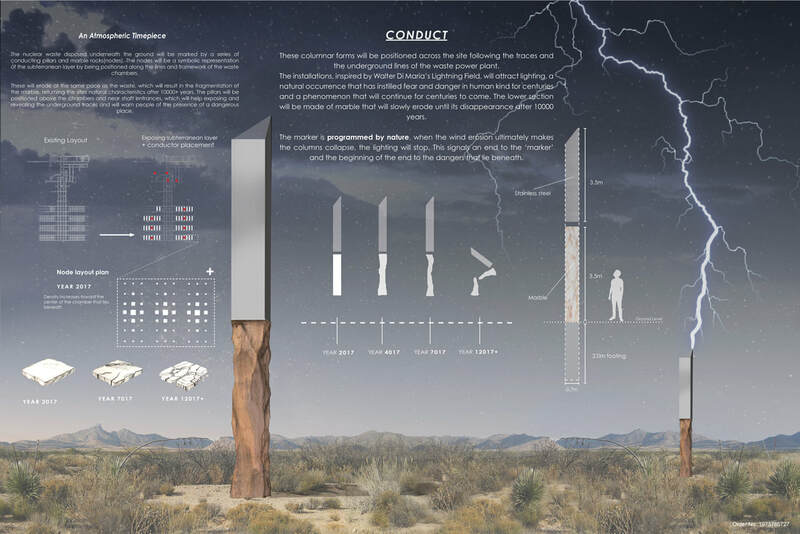 The marker is programmed by nature, when the wind erosion ultimately makes the columns collapse, the lighting will stop. This signals an end to the 'marker' and the beginning of the end to the dangers that lie beneath. It runs the year 12017. Humans have almost disappeared from planet earth for unknown causes thousands of years ago, the last ones remembering anything of such a culture are long forgotten. Street signs, buildings and roads are now completely meaningless to the dominating society, strange creatures that, for unwillingness or inability, haven't developed any language or communication system. What they experience comes purely from survival instinct and primal sensations. In the middle of a desert, remnant of an ancient time, lies a concrete block. A maze appears out of the wastelands in a territory once known as “New Mexico”. Like the Minotaur and the Labyrinth, it is a combination of a beast and the containment: an artificial structure which slowly fuses with the changing nature for millennia to come. As one slowly wanders into the maze, its walls get higher, its pathway more narrow, slowly engulfing its user. In its center, stands a single monolith. 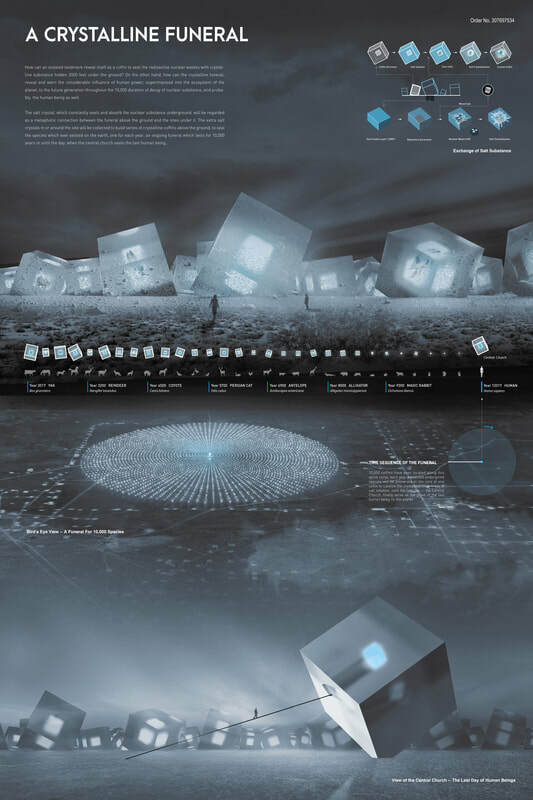 With no true solution, the maze becomes a breeding ground for different narratives which in turn deter not only its users but any potential future explorers. Mauzooleum takes the shape of a wearisome touristic site which calls on a slightly morbid interest. A kind of never seen before haunted journey, where the general public ignores everything about what will be exposed to him. 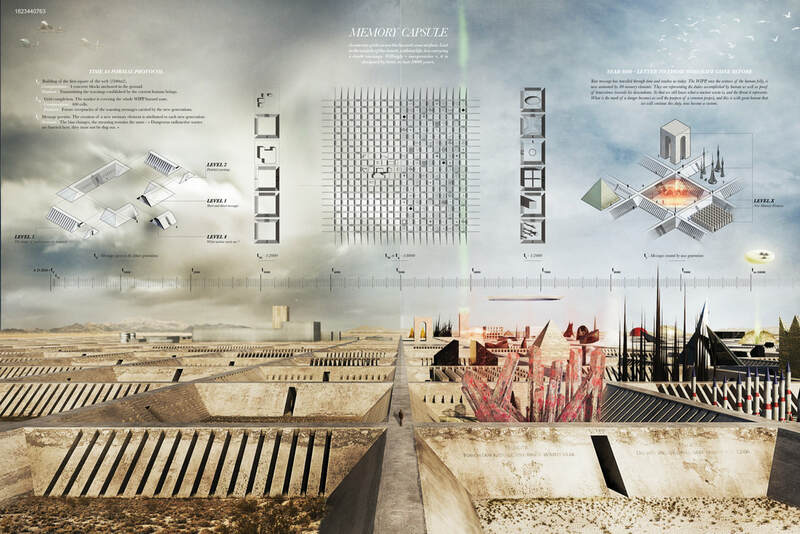 Rumours evoke a necropolis and a sanctuary, radioactive waste and white tigers, all of this set in a dry enclosure dominated by cooling towers at the heart of a deserted region. In the end, for civilizations to come, either it will remain the oral memory of a forbidden sanctuary where the pilgrims came to put down offerings as a token of their worship. Or else, rubbles of a vast landfill will emerge through excavations, representing the inertia of a frenetic society perverted by the electric youth. To be understood and trusted, memory must be actively transmitted. This can be achieved by the ancient way of the ritual: 10,000 vertical stones covering the site, placed regularly along an Archimedean spiral, form an architecture to be ritually dismantled. One stone per year. The last one, in the center, revealing the main entrance shaft of the underground facility. 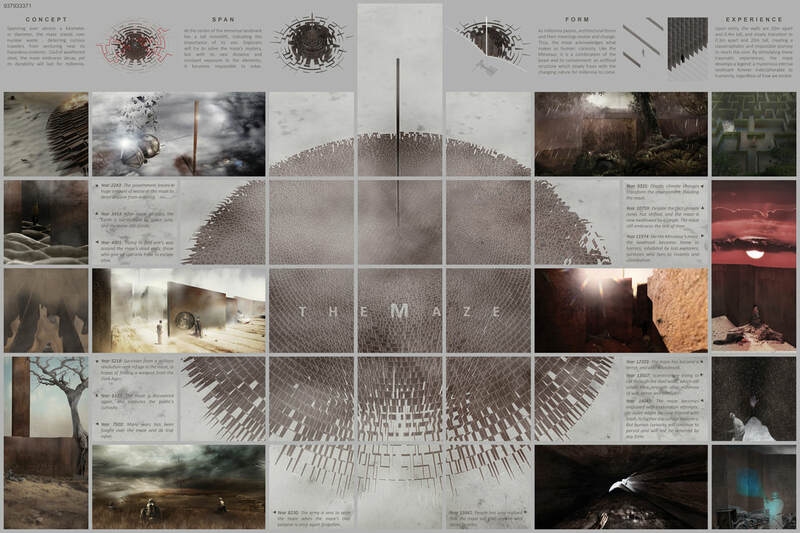 To allow societies to adapt over time their discourse about the site, this architecture does not directly warn about the danger underground, but rather about the interruption of the ritual itself: the message is to pass on the message. « The truth should live from age to age, as it were retailed to all posterity. » - W. Shakespeare, Richard III Truth: 173600 m^3 of nuclear wastes are buried here. This reflects the human folly. We must now prove that we are aware of that, and spread this message. Tradition: A repeated process, the addition of memory elements at each generation. By tradition, the message is fixed, reinforced and transmitted to the next generation, both physically and mentally. Heritage: A concrete grid, the first WIPP marker. The receptacle of new ways of conveying a same message. The witness of a project common to the humanity. 10,000 years from now, although customs, languages, infographics and other products of modern civilization may have been radically shifted or diminished, transuranic waste is a persistent material that will still exist and being detectable. Based on this characteristic, the project, Ripple is proposed to notify the existence of Waste Isolation Pilot Plant (WIPP) by informing future generation the relevance of the WIPP and the other nuclear waste sites in North America. 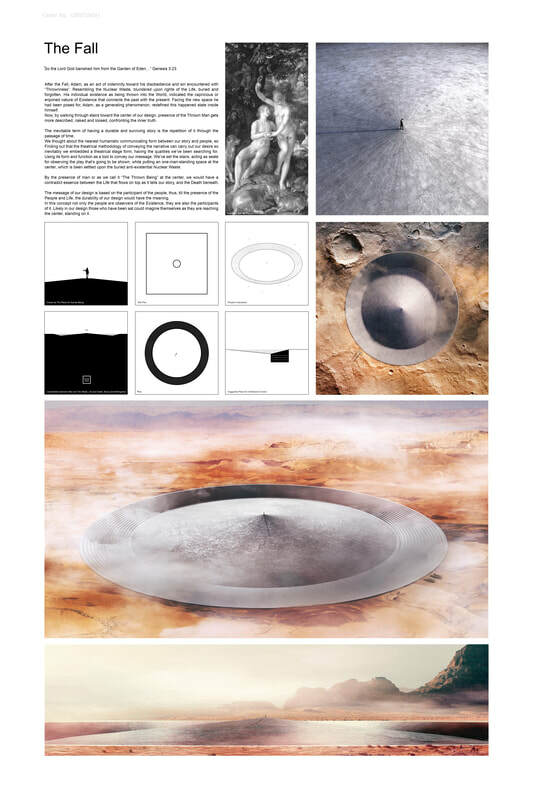 The radial landform, central dome and informational sculpture created, are designed in multiple scales with different forms to ensure the the existence of the WIPP as a message can be delivered for the duration of 10,000 years. 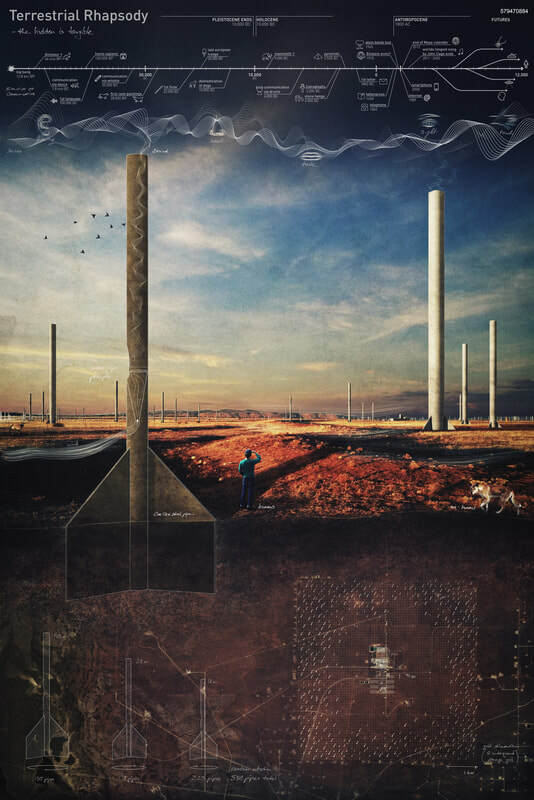 We propose a redundant system of markers that deter inadvertent human interference through relics drawn from the Waste Isolation Pilot Plant. These are residual markers; artifacts reclaimed from production generated by an economy of profiles that move and displace nuclear material into two states, radioactive and nonradioactive waste. Language, like radioactive material, has a half life. We must complete this process by proposing a folkloric relay system of devoted worshipers protecting a burial site. Noncarcinogenic profiles are cannibalized and cut into large monuments moving into a state of metamorphosis as cerebral markers transmitting heat and sound to warn intruders. The communication lie in the very core of the advent of the anthropocene, the meanings it bears differ through spatiotemporal subtleties of culture. Its basis, however, are always deeply rooted in its respective contexts. With the objectivity of science being the ultimate context, we resort to the language of the biochemistry to send a message to the future generations. The communicate is layered, so as to subconsciously compel even to those who cannot yet understand the nuances of said language. The message feeds on mankind's inherent curiosity as a way to ensure its influence for millennia. After the Fall, Adam, as an act of indemnity toward his disobedience and sin encountered with “Thrownness”. Resembling the Nuclear Waste, blundered upon rights of the Life, buried and forgotten. His individual existence as being thrown into the World, indicated the capricious or enjoined nature of Existence that connects the past with the present. Facing the new space he had been posed for, Adam, as a generating phenomenon, redefined this happened state inside himself. Now, by walking through stairs toward the center of our design, presence of the Thrown Man gets more described, naked and loosed, confronting the inner truth. 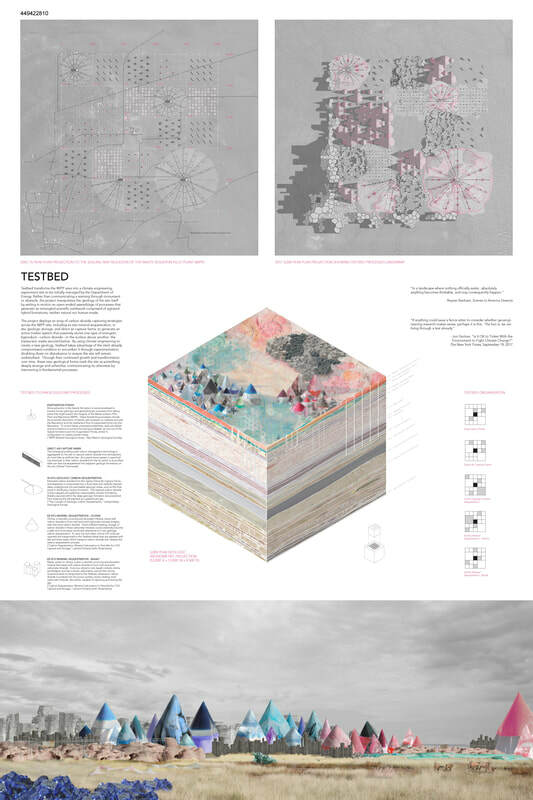 We propose a natural intervention vis-a-vis the creation of a salt farm deriving from the site’s existing landscape and infrastructure. We projected the constellations from the year 12,017 A.D. onto the landscape through a system of pools and canals that would permit the production of salt. With time, the pools of water would evaporate, forming salt mounds. The salt acts as both a sealant and and a marker: its temporal significance would only be decipherable to the civilization technically able to view the site from above. 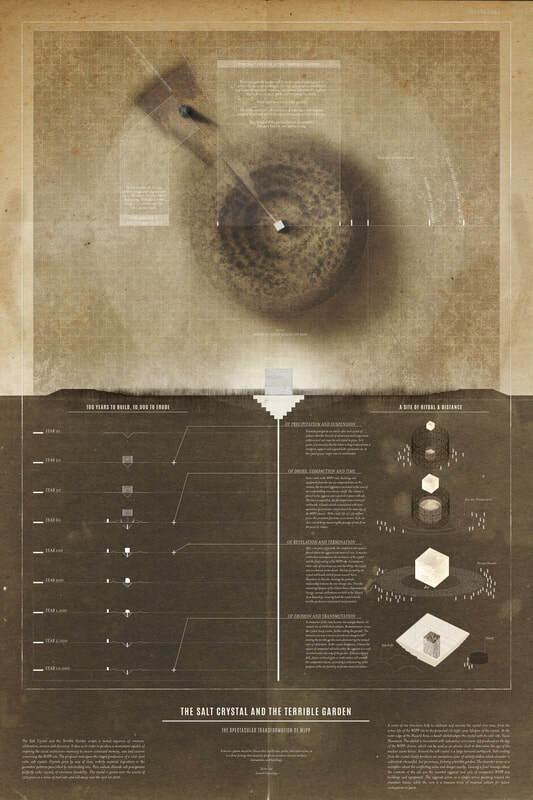 Its radius is marked by a ring of salt, defining and protecting the sacred. The black hole covers all the site area. It has one simple task, to hide what is beneath it. No words or symbols needed. They will evolve and change. The understanding of the object will be done based on the six basic emotions anger, disgust, fear, happiness, sadness, and surprise. Those who will reach the site, will have two choices, to go under or climb over it. In both cases, they will be facing darkness and emptiness. THANK YOU TO ALL THE NUCLEAR COMPETITION PARTICIPANTS AND JURY.